As one more thing has happened to threaten the good of this day, I find myself reflecting on everything. It’s fitting that just this morning I “pinned” a quote on Pinterest, “Take a deep breath. It’s just a bad day, not a bad life.” That is exactly what I need to do today. The day started after yet another restless night’s sleep. We had found a house we wanted to put an offer on this past weekend, and we had been waiting for a call back from the agent. Unfortunately the call came this morning that the sellers had received another offer and were going to negotiate it rather than take on multiple offers. It was crazy. I was disappointed, and the rest of my day went from there. Now I sit with freezing hands and a chill down my spine realizing that our heat hasn’t been working all afternoon. It just kept getting colder and colder until I finally checked all the radiators to find them cold and lifeless. Space heaters to the rescue! When I first started this post, I was going to talk about all the bad things that happened today and highlight the couple of good things. But as I jotted down the good and the bad, the good list was much longer. So rather than dwelling on the bad for today, let’s focus on the good. 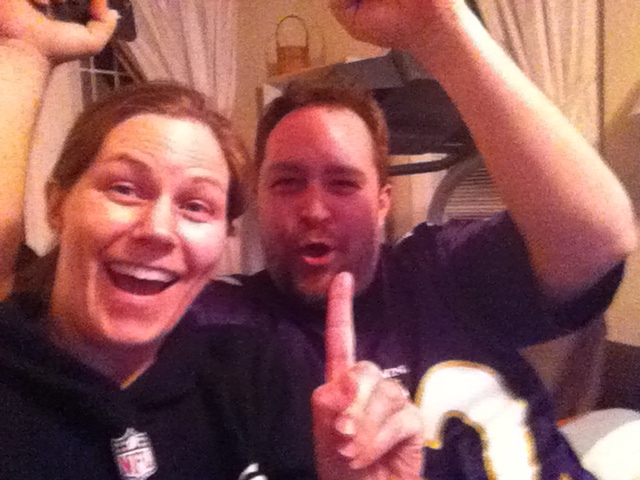 Good #1: We got to wake up knowing that the Ravens are going to the Superbowl! Good #2: I got my workout in this morning thanks to 20 minutes with Jillian Michaels and her Shred! Good #3: The kids played well together all morning, leaving me alone to deal with my disappointment and sadness over the house. 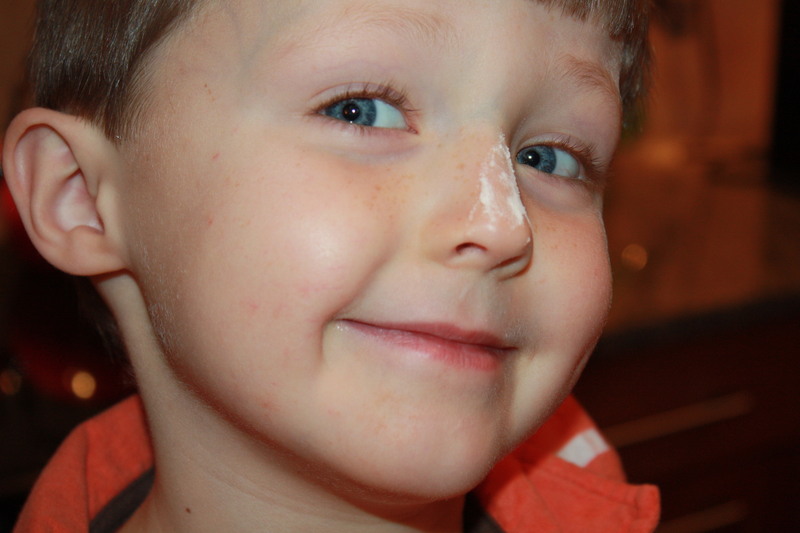 Good #4: We had a drama-free trip to the grocery store. It was heaven! 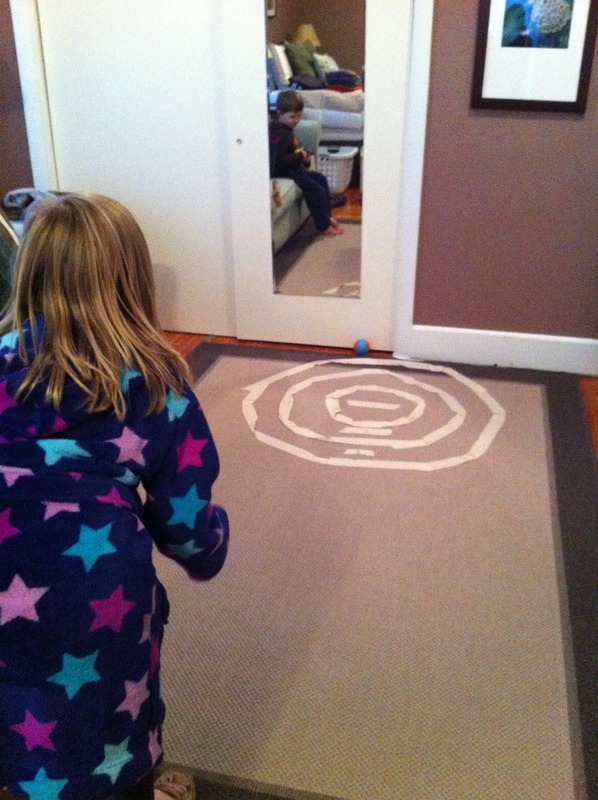 Good #7: Thanks to another Pinterest find, I created a fun indoor game with the kids. We called it Sorry Rollers (after Sorry Sliders). Then Cooper made up a game of throwing a tennis ball through a moving roll of masking tape. We had a great time together. Or maybe just a nudge… Out of bed, that is. Every morning this week I have set my alarm for 5:40am. I have set out my workout clothes the night before. I have told myself that I must get out of bed and exercise to start my day. Unfortunately I only did it once this week. Every other morning I have pressed the snooze button an average of 3 times before finally getting out of bed, walking past my workout clothes and trodding directly into the shower. I have two excuses. 1. My bed is so cozy and comfortable. It’s winter, which means it is usually dark outside when I’m waking up. These two factors together do nothing to inspire me to get up and get moving. 2. My two workout options are to either run on the treadmill or do a video in our bedroom. If I do the treadmill, Mason wakes up early and comes down to watch me. I’m already bored out of my mind just staring off into the distance (rather than my preferred method of watching TV), and then to have her sitting there with me just makes me want to end the run early. If I do a video in our bedroom, I will be interrupting Jeremy’s sleep. He says it’s ok, but I feel bad. I need to get over my excuses and just get up, but it’s been hard lately. Luckily we’ve been getting to the YMCA a couple of times a week so I’m not skipping all of my workouts. But in my attempt to be healthier and fit in my clothes better, I need want to exercise more often. If only Jeremy were slightly awake enough to give me a little push out of bed… Better yet, I need to give myself a swift kick to the rear and get moving! It’s 2013. I’ve finished my 30 Day Mom Challenge. I’ve posted about Cooper’s birthday. Those were the big things to start out the new year. So I ask, where do I go from here? When I celebrated 4 years of blogging, I made the goal of blogging at least once a week. Technically, I would have accomplished that with Cooper’s birthday post, but I was compelled to write today, so here I am. There are so many things I could write about… starting our home search, wanting a new wardrobe, needing a girls night out, excitedly awaiting the birth of my new nephew, the real push to lose a few pounds… But I’ll save those up. Today, I just want to do a brain dump. I’ve been home with a sick Cooper all day, so it has been really quiet. When I don’t have anyone to really talk to, I just need to get it all out, which means today you are my lucky listener reader. I bought a gift card for a friend, and now I can’t find it. I swear it was in my purse, but it has disappeared. Nothing irks me more than losing or breaking things that cost a lot of money. My sister bought us a membership to the Providence Children’s Museum for Christmas, and it is probably the greatest gift ever! The museum was too expensive to justify spending money each time we went when we only stay for about an hour and a half. But with the membership, we have already gone 3 times! It’s a perfect time-filler or rainy day activity. We signed the kids up for classes at the zoo for the spring. Cooper is going to a class to learn more about Red Pandas, and Mason signed up to take an art class about Red Pandas. They are both excited – but I think I’m more excited. Jeremy and I are celebrating our 10 year anniversary this year. I want to do something big and exciting. He wants to go to a conference in Salt Lake City the same weekend. Now I’m trying to figure out if something big and exciting can be found in or around Salt Lake City. If you have ideas, please send them! Our old Macbook is dying. I want a new Macbook Air or something. With a house purchase hopefully in our near future, big purchases have to be put on hold. Then we’ll feel house poor again, and a new computer will get pushed out of line yet again. I always wonder how people stay up with new technology all the time. It is so expensive! Jeremy and I have started 1,2,3 Magic with the kids. I think it’s working, but I want to re-read it. It is hard to know when it is right to start counting. No matter what, though, I definitely recommend it! Watching the Golden Globes last night, I was reminded yet again that I have still not seen Les Miserables. It was the one thing I wanted to do over Christmas break, and it never happened. Now I don’t know when I’ll see it, but I feel I MUST see it in the theaters. I miss hosting people at our house. I loved socializing and inviting people over when we lived in Maryland. I hope we can find a great neighborhood or at least great new friends who will like coming over and hanging out with us. We started talking about our Disney trip for 2014. Is it too soon to start the countdown? I can’t wait!! That’s my brain dump for the day. Happy Monday to everyone. I hope your week has started off well, and enjoy the rest! Last week, we celebrated another milestone. Cooper turned 5! How did we get to 5 so quickly? While I know it wasn’t just yesterday that he was a baby, but it seems like this was just yesterday. And also this! 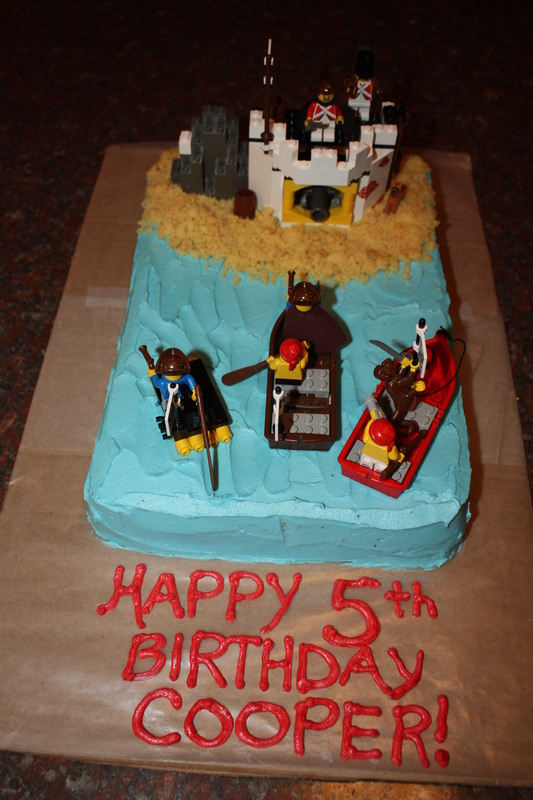 To ring in the completion of Cooper’s 5th year, we celebrated with a Lego pirate cake. Of course I baked the cake and spread the blue “water” buttercream. I even had the idea of using some of Cooper’s leftover school cupcakes to make the sand. But then Jeremy took over. A man boy with his Legos – they really are a multi-generational toy and will never go out of style. He received a lot more Legos, Ninjago stuff, Teenage Mutant Ninja Turtles, and more from family and friends. 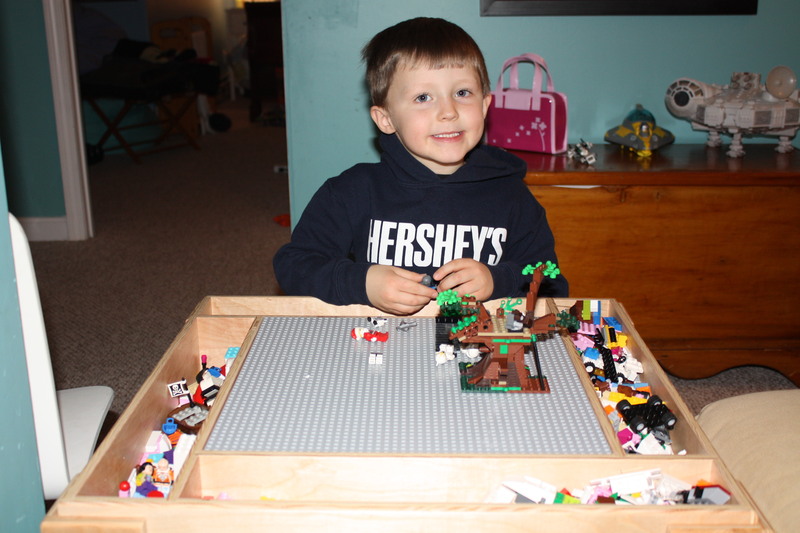 His big presents from us, though, were tickets to a Providence Bruins hockey game and a Lego table. Both were big hits! He looks so grown up in these pictures. I am in awe of the boy he is becoming. He is one of the sweetest kids I know. He loves so much. When he is passionate about something, he goes in whole-heartedly – seriously, the kid could spend hours looking at Lego instruction manuals or Ninjago figurine pictures. \ He mostly usually sometimes follows directions. He does well in school. And best of all, he makes us all laugh. Ok, so I’m just bragging too much. I’ll stop. 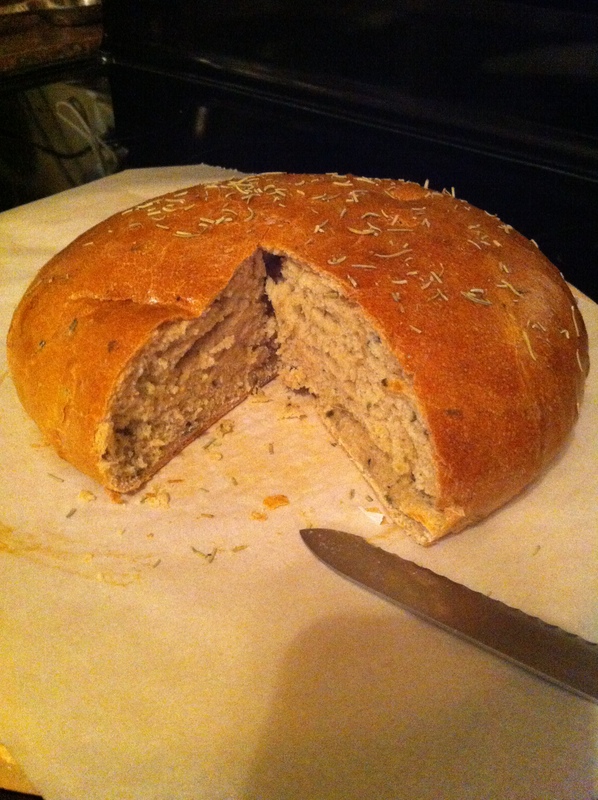 Except for this one last picture…. We love you, Cooper! We look forward to what the next 5 years will bring! I made it! I actually made it to 30! Despite the little holiday break, I have continued my plan of challenging myself – not only as a mom, but as a blogger. Today’s focus was love. Like I mentioned before, it was supposed to be a lay-up. It stinks, though, when life gets in the way. We woke up this morning to a broken refrigerator. We didn’t know that at first, but we noticed our freezer contents were certainly not frozen. Later, we realized the fridge part was not working that well, and even after hours of the freezer temperature turned up, nothing changed. Oy! Needless to say, cleaning out a freezer of melted ice cream and popsicles and spoiled meat is not the way anyone wants to start a Monday. Thankfully I have a husband who always helps me move past the stress. He can always make me laugh. And he got me back to my focus through his LOVE. After a busy day of work, I got to come home to Cooper and my mom playing together. It’s always hit or miss with Cooper these days. As he gets older, he definitely has opinions about whether he will give you some love. Today was a hit, though. He tackled me with hugs and kisses. Thank you, Cooper, for your LOVE. Mason always love to go to school. She is often in such a rush to get out of school in the morning and to the bus stop, that I don’t always get the chance to hug her and kiss her goodbye. Today was one of those days. Between cleaning the freezer and getting everyone ready for school and work, it was quite a morning. I was struggling with a Cooper issue, and Mason raced to the bus stop with Meema instead. So I waited at the front door to wave as the bus drove by. Thankfully I got my hugs and kisses when she came home. While she can get a little overbearing with her love, I appreciate her being so forthcoming with it, as well. Thank you, Mason, for giving me so much of your LOVE each and every day. When I first read what the challenge would be today, I thought about how I would show the love I have for everyone. But what today turned into was them showing me instead. It was not what I expected, but it was definitely what I needed. I have learned so much about myself and my kids the past 30 days. Motherhood is a give and take. It is definitely a lot of giving – as moms, we feel like we give and give and give. But so many of the 30 challenges were about learning how to receive as well. Mason and Cooper surprise me with their strength, their fun-loving attitude, and their unwavering love for me and their dad. I am blessed to be their mom, and if I learned anything from these challenges, it would be to show my love more and also let the love in more. I’m thankful for my life – my kids, my husband, my family! I really couldn’t ask for more. Turn off your phone, computer, or TV when your child is with you. I am rarely on the computer during the weekend days. We use our phones mostly since we’re out and about. Then I get on the computer (to blog) at night when the kids are in bed. So again, that one wasn’t so hard. The hardest was turning off my phone (or just not looking at it.) Both kids started their new swim session this morning at the YMCA. A lot of times, I am usually trading glances between the pool and my phone. Not today, though! I didn’t look at my phone once during their swim lessons. I watched them the whole time. And while it does get a little boring (especially when the kids are swimming in the deep end and hard to see), I enjoyed focusing on what they were learning and how they were doing. 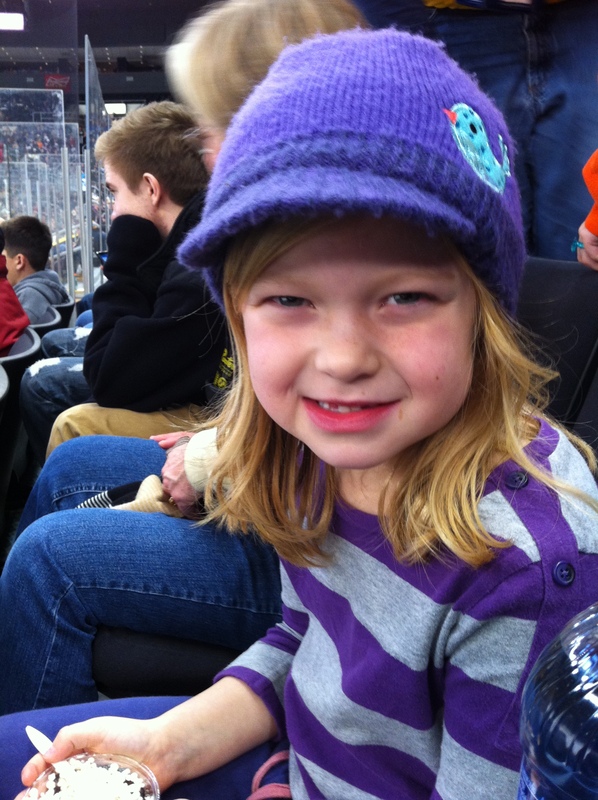 My girl – in all her Ravens purple! 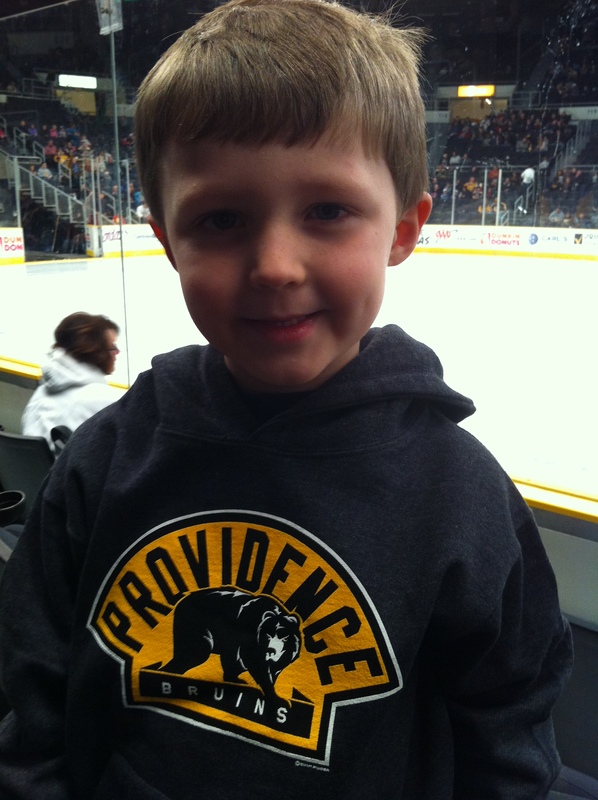 My boy – celebrating being 5 and a hockey fan! All in all, I think I did pretty well with this challenge. I’m glad it fell on a weekend too, because if it had been during the week, it would have been way too easy for me to only have to give up my phone for a couple of hours. Doing it on a Sunday really pushed me to focus on them and not on all the social media and email. It was even a bit refreshing. I do agree that we are all too addicted to our smart phones. We have a rule of no phones at the dinner table, but we do enjoy a dinner in front of the TV once a week. I am going to try to put my phone down more after this challenge, but I also feel like we have a decent technology balance in our house. There is always room to change, though. Teach your child a new word. Our day started with Mason learning about “software updates.” We were downloading a new game on her Leapster, and when we plugged it in, the device needed an update. Mason asked, I explained. Cooper later learned about “Pilgrims.” I really lost track after that, though. Both Mason and Cooper are pretty inquisitive. Cooper, being 5 now, asks a lot of questions. Mason, as she learns to read more and more, asks questions about what she is reading. And add a rousing game of Apples to Apples Disney Edition to the mix, and we had a day full of new words… not unlike every day to tell the truth. I’m only two days away from finishing the challenge. Tomorrow’s challenge will be pretty hard. But Monday’s challenge (the last one) is easy peasy and what this whole thing is about. Stay tuned to see how I finish it out!